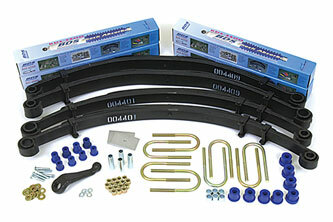 4" Jeep CJ5, CJ7, Scrambler; Shocks shown may differ from base kit. 1. Vehicles equipped with the optional Dana 44 axle will require 040005 (Qty. 4) U-bolts listed in the accessories. 2. If your vehicle is equipped with manual steering, you can buy the kit without the PS pitman arm, but BDS Suspension does not offer a manual steering pitman arm. You will need to aquire this from another source. 3. If your vehicle is equipped with an anti-sway bar, a sway bar extension kit (available in the accessories section ) will be necessary for your sway bar to function properly. 4. If your CJ is heavy in the rear ( ie. Hard top with full size spare) you should consider the 114208 add-a-leaf kit in the options to stiffen up the rear leaf springs and reduce the possibility of low rear ride height. This is recommended for all CJ8 Scramblers. 5. Shackle bushing kit 074002 listed in the accessories is highly recommended. 6. Extended brake lines recommended.